Cheaper than a bus surely that cannot be true! Looks like standing room only folks! YES...it's true it can actually work out cheaper to share a Public Rank Taxi than getting the bus! On the 27th March 2018 the Liberty Bus Group announced that as from 2nd April 2018 the bus fares are going up by as much as 10%...So now it can work out even cheaper by taxi, please read the example below to see how much 4 passengers can save by getting a taxi over waiting for a bus to take them up to a 2 mile journey. Example: 4 people travelling up to a 2 mile journey in a Public Rank Taxi would be charged approximately £7.00 (£1.75 each). The same 2 mile bus journey would cost 4 people £8.80 (Liberty bus ticket £2.20 each as from 2nd April 2018)...That is a £1.80 saving over waiting to get on a bus. The other benefits are the taxi drops you off at your door and not a bus stop!, There's NO waiting until a pre-set time before leaving the bus station or bus stop. NO stops every 5 minutes or so on route to drop off or pick up more passengers, and at the end off your journey by Taxi you get taken to your door and not dropped off at your nearest bus stop which could still be quite a distance away from where you want to be. 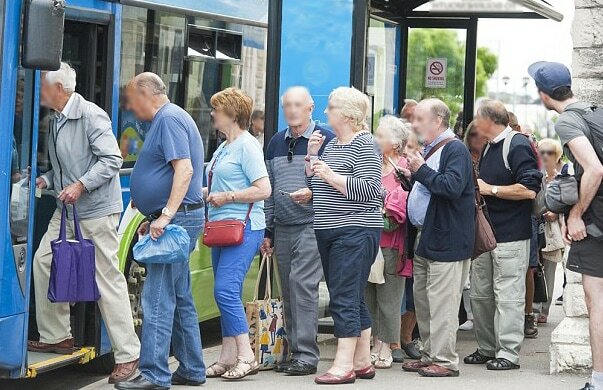 Did you also know that the Liberty bus company gets a £4 million subsidy every year from the States of Jersey which is the equivalent to about £1 per person for every bus journey. ​Nice little earner for this private company...On the other hand a Taxi drivers gets NO subsidies and costs the taxpayer absolutely nothing. So why not think about sharing a Taxi in the future, its less hassle than waiting around for a bus and as this example shows 4 people can also have a door to door service in comfort for less than the price of 4 bus tickets!